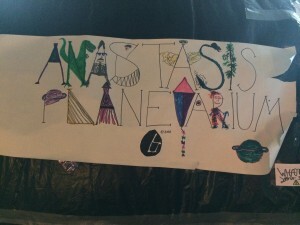 It’s hard to describe to people all of the magic that happens at Anastasis on a daily basis. It really does feel like something special, a magical quality of falling down the rabbit hole into another world where school is fun and challenging and wonderful. The learning that happens here is very organic, it lacks a formulaic approach. So when people ask us how they can do what we do, it isn’t a simple answer. Anastasis learners are in a continual state of growth, discovery, and creativity. We are just wrapping up an Inquiry unit about “How the World Works.” As a school, we are preschool through eighth grade. All of our students engage the same big guided inquiry for a 5 week block. Although the driving inquiry is the same for all students, I break down the unit into some key concept lines of inquiry by age level. We have a primary, intermediate, and jr. high key concepts that provide entry points into learning at a developmental appropriate level. Our primary kids looked at How the World Works from the inquiry prompting that: people have daily habits and use time to help guide their day, week, month, and year. This gave them the opportunity to explore calendars, time, seasons, patterns in growth of crops, school habits, moon phases, sun, etc. Our intermediate students looked at How the World Works from the inquiry prompting that: predictable patterns help us explore objects in the sky and their connection to our life on Earth. 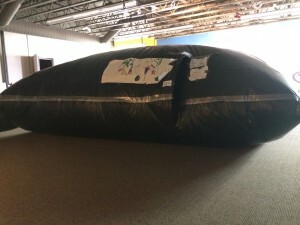 This allowed our students to explore movement of the solar system, moon phases, constellations, galaxies, history of humans understanding of patterns in the universe, technologies that help us understand patterns, how the patterns in space impact life on earth, how animals and plants rely on patterns. Our Jr. High students explored How the World Works from the prompting that: Food comes from many places and goes through many changes on its journey to us. They discovered more about where produce comes from, what GMOs are, what the role of the FDA is, what chemical additives food has, farm to table, organic vs. non-organic, responsibilities of humans in food production and consumption, how food production has changed over time, practices for mass production of meat, what happens when our food resources have been exhausted? The nice thing about having ALL students in the same big guided inquiry during a block, is the incredible overlaps in learning that occur between classes. This provides truly amazing opportunities for our students to learn from and with each other. We take advantage of that overlap as often as possible! This is the point that the magic I mentioned above starts to happen. Our teaching staff is awesome. They are some of the most creative, innovative, forward-thinking people I know. Even better: they provide the space for kids to be curious and expertly help them navigate that curiosity for new learning. This block offers such a rich picture of what learning looks like at Anastasis that I just have to share it. Notice that EVERY level of Bloom’s Taxonomy is addressed in this process, every subject woven into their learning naturally. The students in Team Weissman began this block with a field trip to a local observatory. This was a really neat trip that I had the privilege of attending with them. Our students got a private tour of the observatory, complete with a history lesson of Colorado’s landscape when the observatory was built, the changes it’s gone through, the building history, and the science. The kids LOVED exploring each part of the building and learning about all of the little “secrets” around the observatory and why it was built the way that it was. They got to go into the basement to see how the base of the telescope is actually free-standing and not attached to the building. They got to open the ceiling. They got to explore each separate part of the telescope and ask questions and learn from an expert. The observatory expert’s passion was contagious. The spark for inquiry was lit in those moments. When the students were back at school, they each chose a line of inquiry that they wanted to know more about. They chose to learn about moon phases, galaxies, planets, constellations, Fibonacci, fractals, waves, plant life, etc. Each student snapped a picture of the QR code for this block to begin digging through resources. This was a great spring-board for discovery. As students dug into discovery, they chose different projects and ideas of how they could share their learning with others. This led to the building of a planetarium that the whole school could tour through to learn more about the universe, green house design, art work to teach about the relationship of plants/fractals/Fibonacci, a telescope, a black hole demonstration, a planetary model, a genius art demonstration of moon phases for the planetarium, and a model of different types of waves. There was a lot of research that happened in this unit. 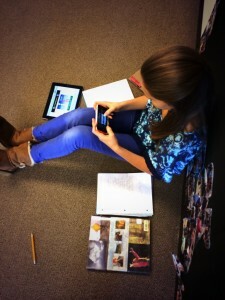 One student showed me how she was using multiple devices to compare sources as she did her research…brilliant! Throughout the 5 weeks I heard exclamations of excitement, pride in what students had created, excitement as they saw what other students in the class were doing. Completely fantastic, magical moments of learning! This week, the students invited every other class in the school to be a part of their learning. They gave each class a tour of the universe in the planetarium and each presented their findings over the last 5 weeks. They also walked them through how patterns in the universe are mimicked here on earth in their greenhouse (made with pvc and shower curtains!). Anastasis is a 1:1 BYOD school. Each of our students has an iPad (the only supply on their supply list) in addition, sometimes they bring a phone or iPod as well. You know what? As awesome as the technology is, it fades into the background. 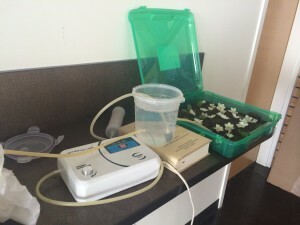 It really is just another tool for learning that we use at Anastasis. It helps tremendously with research, connecting with experts all over the world, typing out and recording ideas. What I love about this last unit is that none of the students chose to show their learning through technology. Each of them chose something tangible to demonstrate learning. The use of technology was brilliant. Truly hybrid learning! 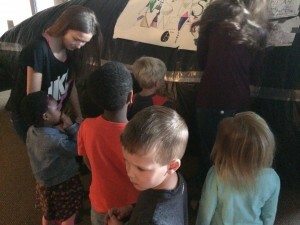 The students who worked on the planetarium used an app called Sky Guide to figure out exactly where in the sky each constellation and galaxy was so that their planetarium would be a true picture of what it would be like to look up into the night sky. 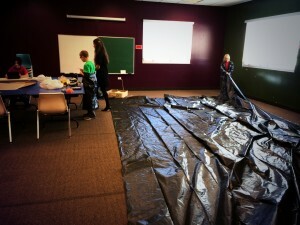 After building the planetarium, the kids decided which way they would align it in the classroom. Then, using the Sky Guide app, they would get in, find out where the constellation was in relation to where they were standing. They poked holes in the plastic in the shape of the constellation and labeled it with a piece of tape. A brilliant coming together of technology and creativity! I wish I could bottle up the excitement that the whole school had as they watched the planetarium being built. The amazing anticipation of getting to see the finished product. The sneak peeks they tried to take. This was a school community learning and exploring together. As Team Weissman worked on this, students in Team Baldwin each chose a pattern that they wanted to learn something more about. They connected to experts, researched, and came up with really incredible questions. 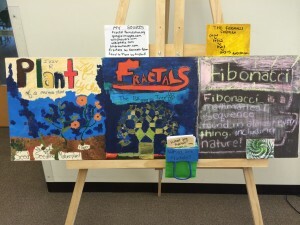 The outcome of this was also student created projects to show others what they had learned. 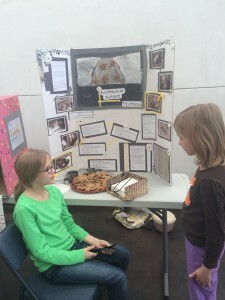 These kids also held an expo day to let others in the school see their learning. They got to be the expert. 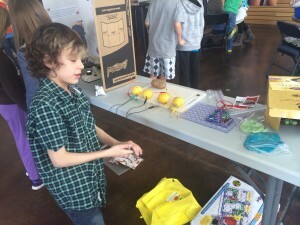 Students explored everything from patterns in the circulatory system, to service animals, to electricity, to dub step, to patterns in baking, the moon, coding, and plant growth. When I asked the kids what they liked best about their projects, the common answer was: getting to talk to my expert. Connecting students with an adult expert (usually using technology) was so meaningful and lasting. They were proud to share with others what they were now an expert in. 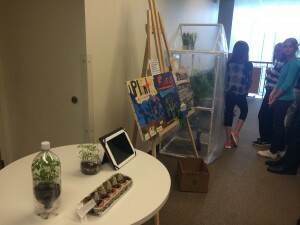 The Jr. High was so impacted by what they learned about where our food comes from, that they created a conference for Anastasis students and parents. They had sessions, round table discussion, asked parent experts to come in and share, and invited a keynote speaker. They also invited other classes in on their learning by asking them to share learning they’ve done throughout the year at their expo. The round table discussion among the students was hands down my favorite part of the day. Hearing these kids challenge each other’s opinions about GMO’s, Monsanto, being a localvore, food production, health, etc. was incredible. They were well researched, thoughtful and considerate of different opinions. They referred back to field trips they had to Growhaus and a local meat market. 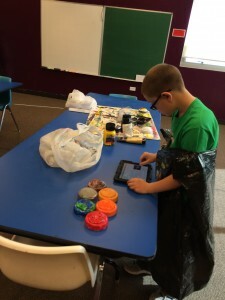 They started out in the community with experiential learning, used technology to learn more, and finished by inviting community to learn with them. This is what learning looks like. It is hard work, there is challenge. There is also beauty and excitement and pride.